“Three,” as a rather famous three-piece once said, “That’s the magic number.” You’ve heard it before, right? All this hoo-ha about how three has some inherent simplicity, perfection or symmetry. Maybe it has something to do with the Holy Trinity. Or maybe it’s a simple as groups of three looking so pleasing to the eye – a fact celebrated by the famous French term ‘Ménage à trois’ which, as we all know, refers to the joy French people experience upon seeing three pieces of cheese at once. 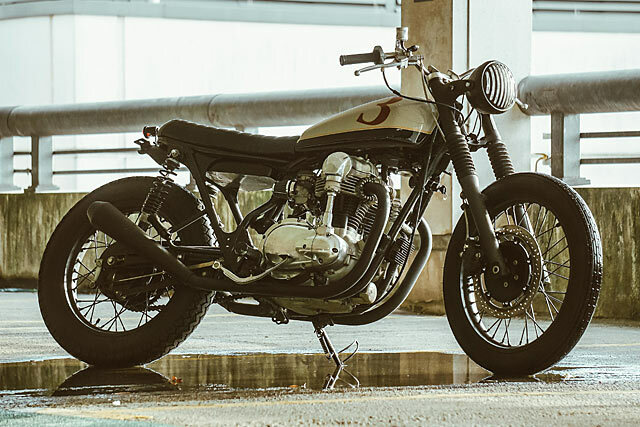 But there’s no better expression of the simplicity of three than this – a bike built for a guy determined to lead a simpler life. 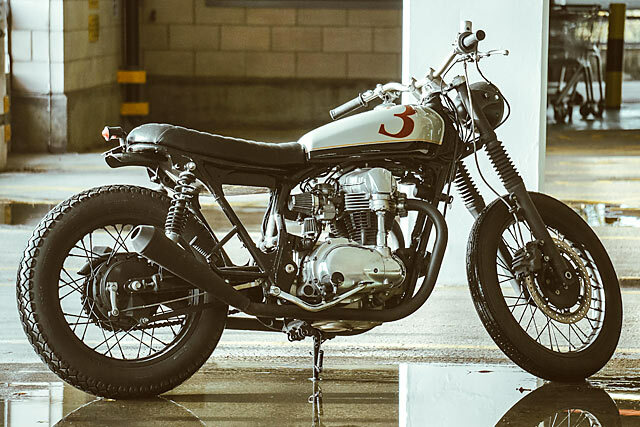 Here’s Untitled Motorcycles with their latest creation – a Kawasaki W300 W400 called ‘3-DOM’. 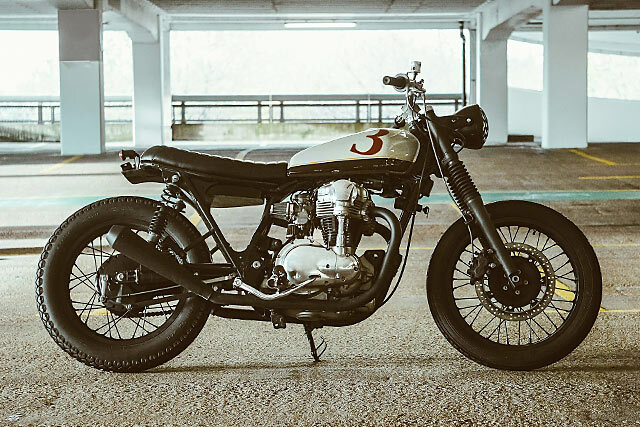 Gidon, the bike’s owner, had been hanging out at UMC’s London workshop on and off for about 6 months while he built up the courage to talk about the ‘3-DOM’ project. “We discovered he was decluttering his life,” says Untitled’s Adam Kay, who runs the ‘shop. 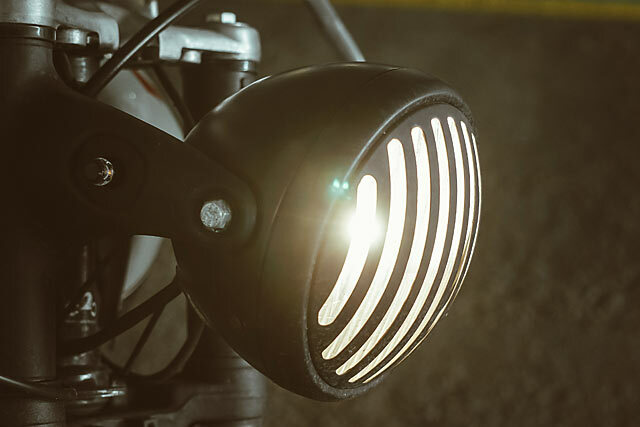 “So a bike to suit that would be perfect. 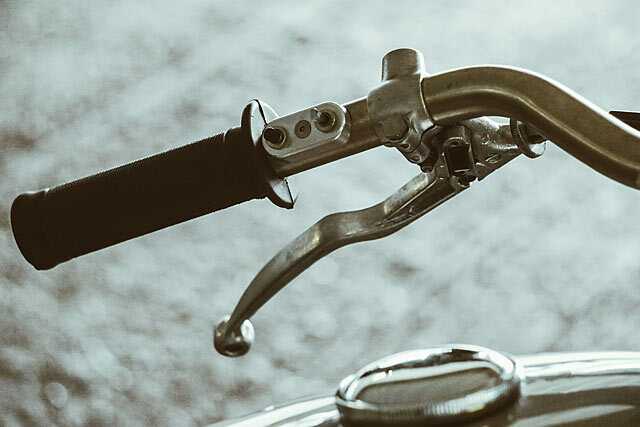 Everything that wasn’t needed had to be removed.” Clearly, Gidon wanted a bike without any of the fiddly paraphernalia that modern bikes seems to have so much of. 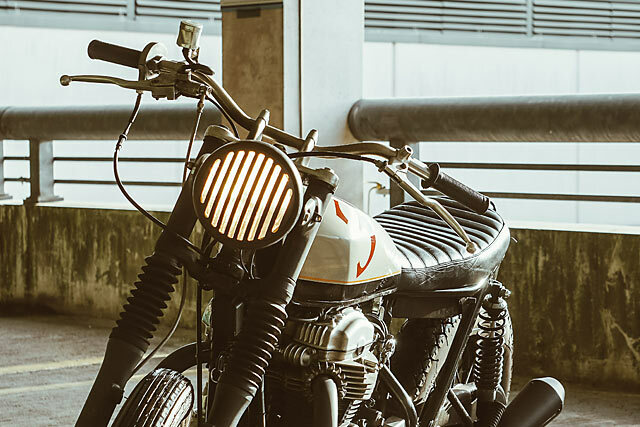 “Ironically, it’s these things which can take us away from the simple joys of riding a motorcycle in the first place,” Adam notes. And we couldn’t agree more. 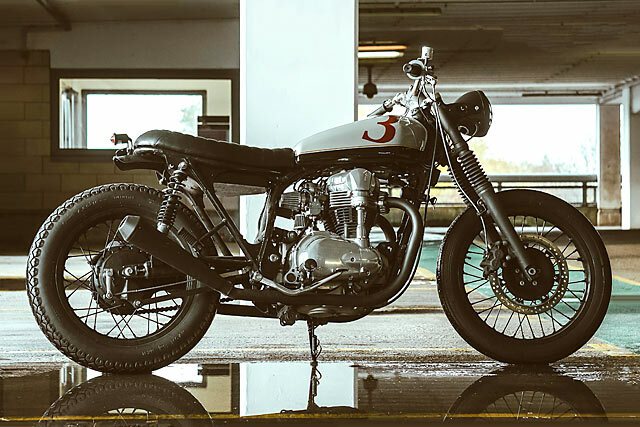 Originally after a Kawasaki W650, thanks to its resemblance to Gidon’s BSA bedroom wall dream bike from his youth, he eventually decided that it just wasn’t special enough. “He wanted something that wasn’t following the masses,” says Adam. And as the W400 wasn’t ever officially imported into the UK, Gidon took to it like crumbs to a biker’s beard. “Our first priority is to make sure the engine and gearbox were working well,” Adam recounts. 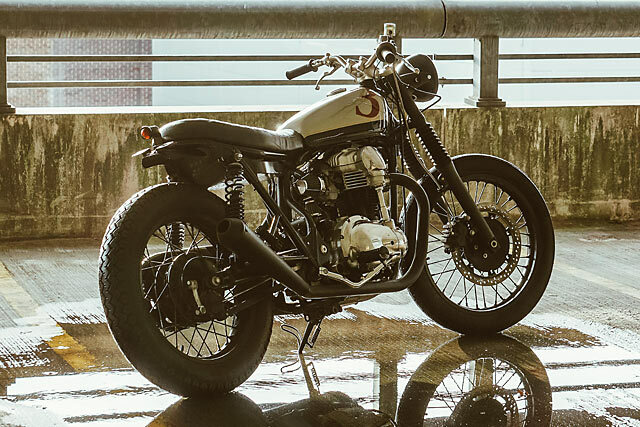 “We’ll never customise a bike until we are happy with how it runs and rides in its stock version. After that, we get to work taking everything off it that we don’t need or are going to change. We want it as stripped back as possible, so we can see it in its purest form; just the wheels, frame and engine.” A list of parts that need to be hidden, changed and upgraded was then drawn up. As you can probably see, it; wasn’t exactly a short list. 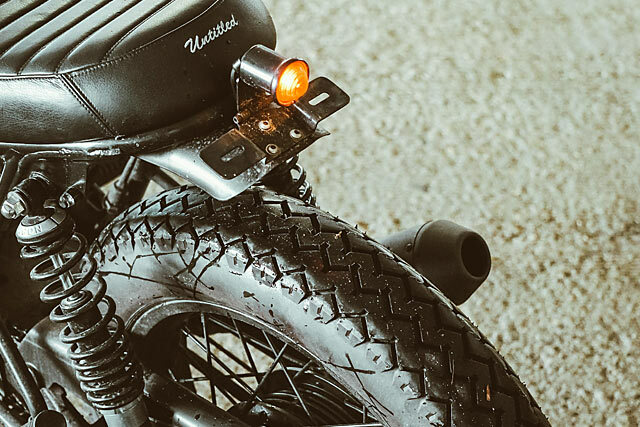 Preferring to work from the ground up on some builds, Adam removed the Kwaka’s wheels, powder coated them satin black and added a new set of classic Avon tyres. Loud black silencers were angled up as much as physically possible while still allowing for a pair of unroasted pillion feet. “A rear hoop was welded on to finish just in line with the rear spindle,” Adam notes. 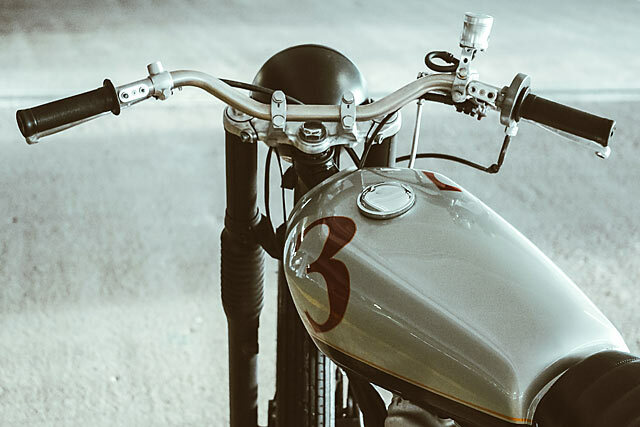 “The battery had to be hidden in an bespoke under-seat box, along with the electrics. 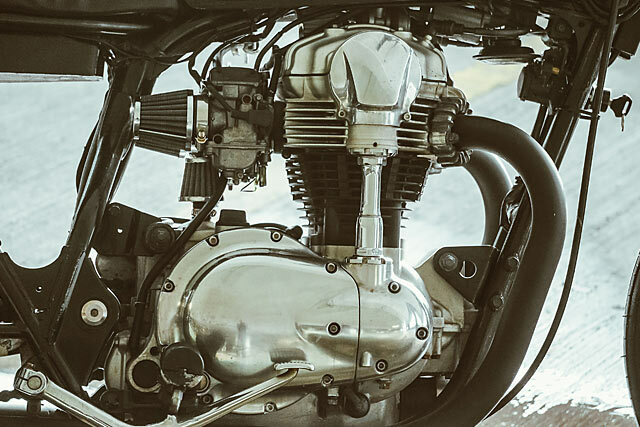 Once we’d made sure it had easy access for servicing, Anita, our in-house electrics guru, figured out the W400’s new wiring system and made it all work a treat. Shop reports tell us that the bike is great fun to ride, and moves at just the right pace for busy London streets. “It puts a smile on Gidon’s face every time he rides it, and that’s the best you can hope for when you make a bike for a customer,” says Adam. How does the Kawasaki sound? In Gidon’s own words, “Very loud!” And we mean gloriously, unashamedly, smile inducingly loud. “Due to the attention to detail, the build took longer than anyone anticipated,” he says, “So I rode it in the recent icy London weather. No mudguards meant a dirty helmet and jacket, my ears were are a little beaten up by the engine…” But these all make for a fabulous brat. “The stripped-down 400 is cracking in London traffic, and there is so much style that any day trip is done as leisurely as possible,” says Gidon. “Whether I am commuting or on a day out, 3-DOM is so much more fun than I could have hoped for,” concludes Gidon. “Bikers and non-bikers alike both smile and chat to me. I am the lucky owner of a beautiful, unique and fun new bike.” But why the name ‘3-Dom’ you may well ask? “Three has become a bit of theme in my life. As well as the obvious wordplay, this is my third bike – so now I guess I’ve officially got a collection going.” After all, what goods a more simple life it it means less bike? And to make sure all the hard work that went into the build is recognised, Adam finished by making a point of thanking the troops – along with Anita, there’s also fabricator Nick, Leather wrangler Glenn and paint pro Jay at JMA. Including Adam himself, that makes it a bike built by 6. Sure, it ruins the symmetry of the story, but for a bike like this, we can live without the Hollywood ending. Three cheers for all of them.